On his sixth studio album, Chris Velan combines pieces of his varied sonic inspirations — singer-songwriters, West African guitar-pop, ’80s rock — with his complex thoughts on life and love to create a rich mosaic. It’s a combination so varied that it risks being jumbled, but on Glow, Velan is able to fit his diverse inspirations together beautifully. 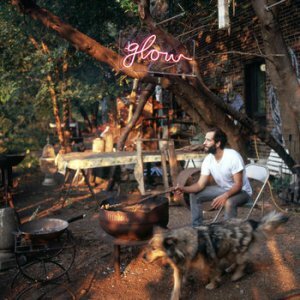 Glow‘s biggest strength is how seamless Velan and his band of Montreal heavyweights — Jamie Thompson (Islands, the Unicorns), Morgan Moore (Barr Brothers), Max Henry (Suuns), Ariel Engle (AroarA) and Ngabo Kiroko (Dear Denizen) — are able to transition from style to style. The strong opener “As They Are” is an introspective, bittersweet folk-pop gem that rolls right into the multi-voiced plea of “Call Me Into Your Heart.” On the following track and album highlight “un-American Gothic,” Velan rebels against the traditionalism of the titular painting and celebrates lost love with a deceivingly breezy guitar part. Later, the buoyant “Listen, Elijah” glides into the forlorn reggae-tinged “Steal You Away” without struggle. pls come to Grande Prairie! Just discovered you driving 14 hours through the mountains with a 7 yo with a loose tooth – we lost StokeFM’s signal driving down to the ferry and meditated on the beauty that is “You Don’t Know What You’re Asking of Me”… Never heard you before, but am eating up your discography online 🙂 and buying what seems needful.